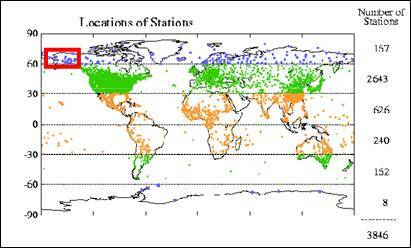 There are very few stations in Alaska with long-term data. The following figures show average the IPCC model plot (from AR4 Fig 9.12) (pink= models with anthropogenic CO2, blue= models without anthropogenic CO2, black= observed smoothed mean). 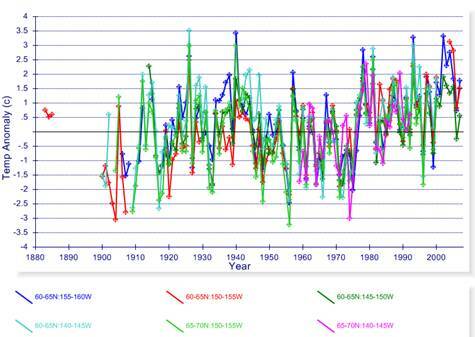 The right-hand figure then has the average annual temperature data from above superimposed on the models plot. 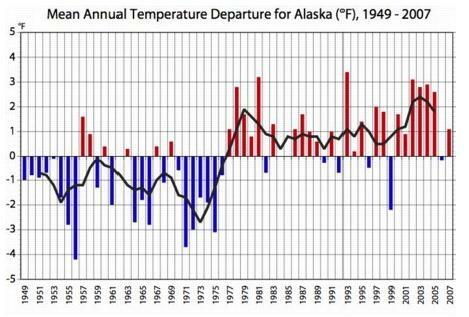 Alaska exhibits extreme natural variance in the temperature data. This results in the with CO2 / without CO2 model bands having significant overlap. . 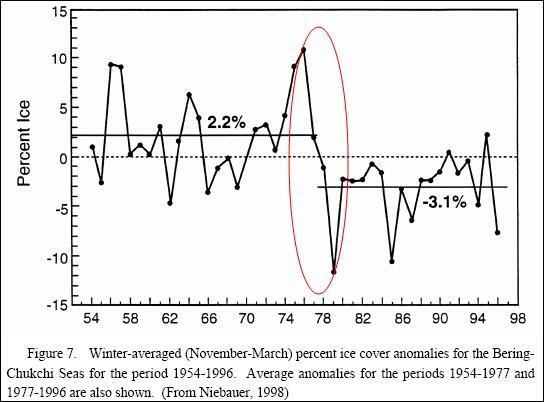 The Fairbanks/Int temperature graph shown above (with data starting in 1929) seems to display a warming trend. 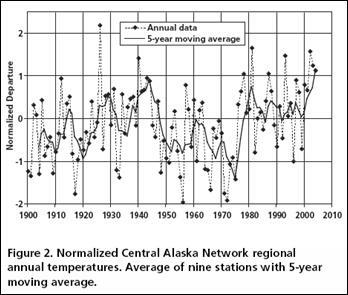 However if it is compared with another station in Fairbanks that starts in 1904 but ends in 1990, a different trend is observed due to warmer temperatures in the early 1920’s. The following figure compares the two stations (with University Exp Stn displayed in blue and Fairbanks/Int displayed in red). 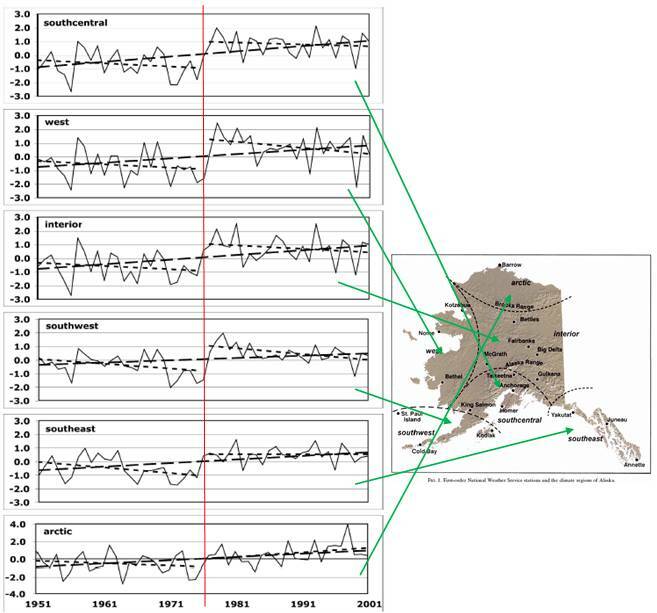 The following figure is from a study published in 2005 (Brian Hartmann and Gerd Wendler: “The Significance of the 1976 Pacific Climate Shift in the Climatology of Alaska”, Journal of Climate, Vol.18, 2005) [http://climate.gi.alaska.edu/ResearchProjects/Hartmann%20and%20Wendler%202005.pdf]. 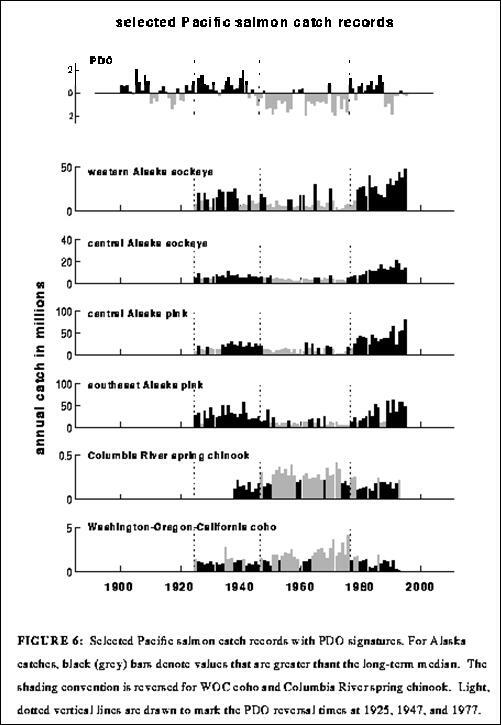 The figure shows temperature trends for each climate region in Alaska, including linear trends for the entire period and for the two periods separated by 1976. Linear trends through the whole period provide a very misleading interpretation. 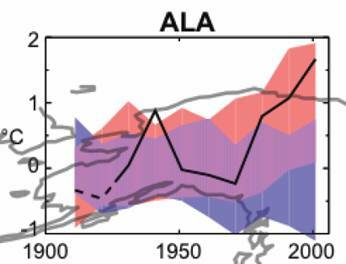 Except for the Arctic region, all of the warming in Alaska occurred in the two-year period of – 1976 - 1978. 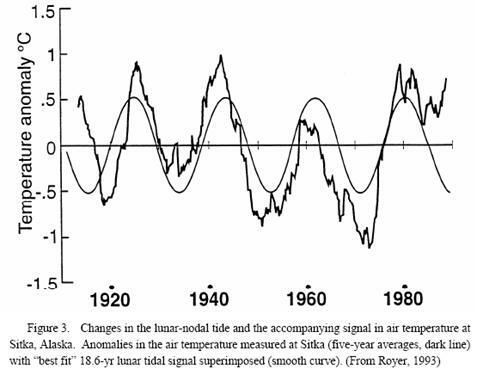 The temperature trend was decreasing prior to the 1976 climate shift and since then has also not been warming. 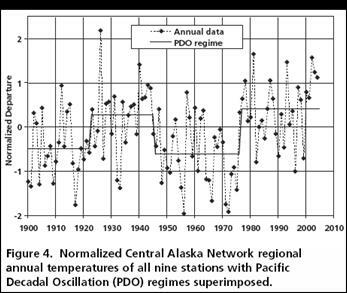 The following figure superimposes the Central Alaska temperature data from above (changed to green) on the PDO data. 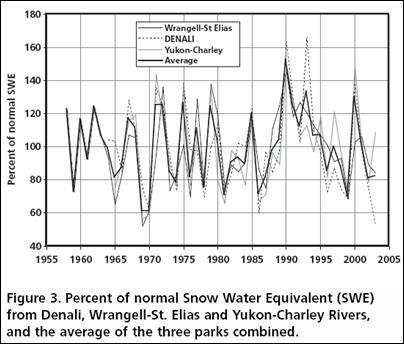 The same study cited above provides the following figure in terms of snowfall. Apparently global warming hasn’t reduced the snowfall below the normal range. 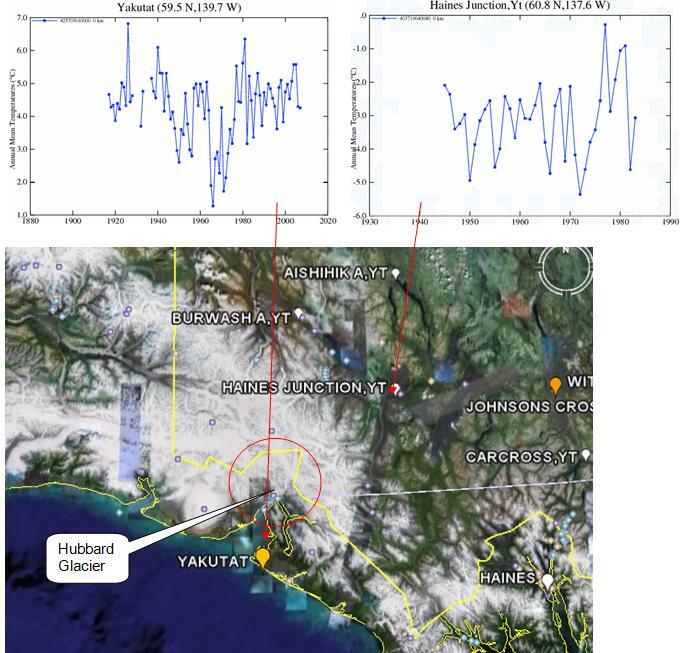 The following figure shows the Glacier Bay glacier retreat from 1790’s to 1990’s (from the above Akasofu paper). The following figure shows the advance of the glacier over the last 100 years [http://pubs.usgs.gov/fs/fs-001-03/]. The following figures show the monthly temperature anomalies and precipitation for Yakutat – the closest temperature station to the Hubbard Glacier. 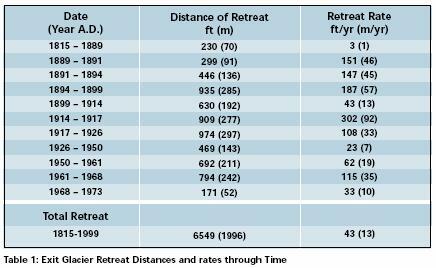 The following table shows the glacier retreat rate (from the above reference). The following figure shows the effect of the 1976-77 pacific climate shift on the Fairbanks temperature stations shown previously (University Exp Stn - blue and Fairbanks/Int - red). Alaskan sea levels have been steadily decreasing over the last century as shown in the following figure (sea level graphs from the UK Permanent Service for Mean Sea Level [http://www.pol.ac.uk/psmsl/]). 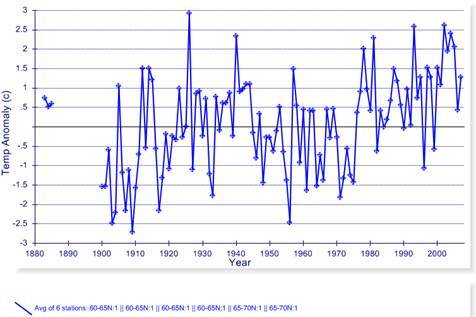 This is mainly due to the isostatic rebound of the area since the little ice age in the 1700s. Clearly rising sea level is not a problem in Alaska.